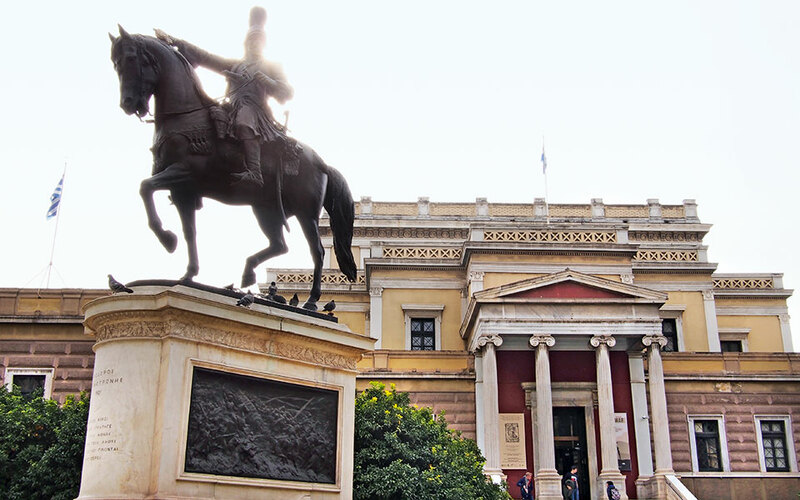 The equestrian statue of Theodoros Kolokotronis at the National Historical Museum's entrance is a major Atheniand landmark. 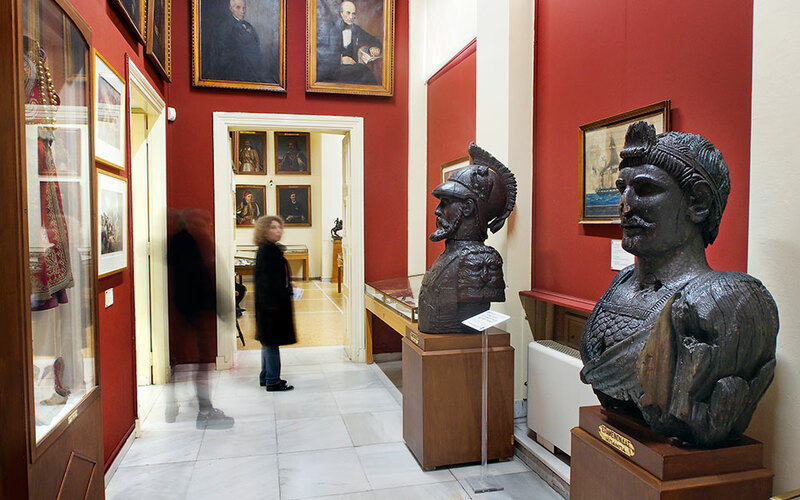 Housed in the Old Parliament building, the National Historical Museum brings to life the story of the founding of Greece. An equestrian statue of General Theodoros Kolokotronis, one of the heroes of the Greek War of Independence (1821-1829), stands guard outside the Old Parliament building in central Athens. For the last 60 years, following the Greek Parliament’s move to its current location on Syntagma Square (barely 300m away), this stately building has housed the National Historical Museum. Visitors enter via a majestic flight of marble steps framed by two naval cannons, also from the Greek War of Independence, that point up at the sky like sleepless defenders of the precious exhibits housed inside. 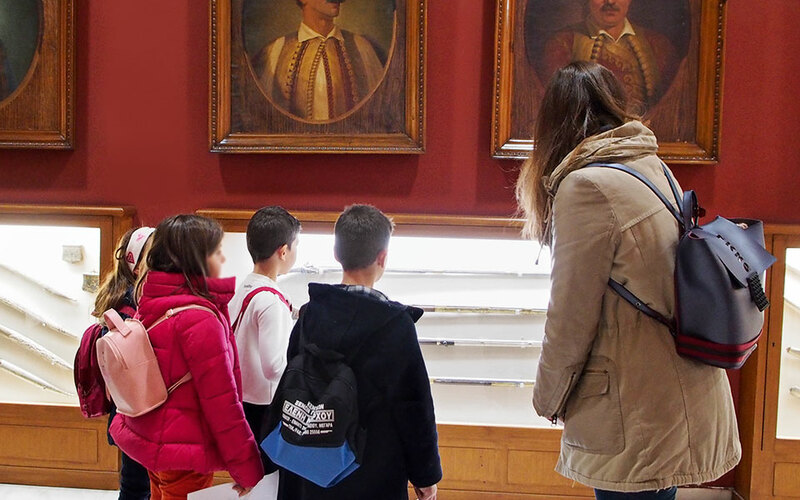 Young visitors learn all about the heroes of the 1821 Greek War of Independence and their struggle. The foyer is forever ringing with the peal of children’s voices, since every year hundreds of schools come from across the country to visit this splendid museum. The Congresss Hall of the Old Parliament constitutes the heart of the museum and hosts temporary exhibitions in its balcony area. 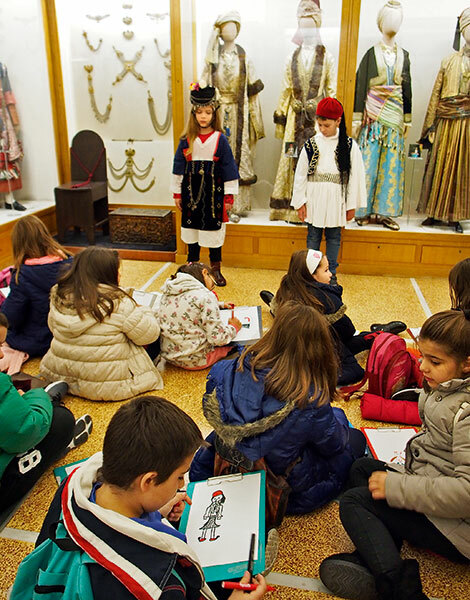 Schoolchildren modeling traditional costumes take part in an educational program in the Folklore Collection Hall. 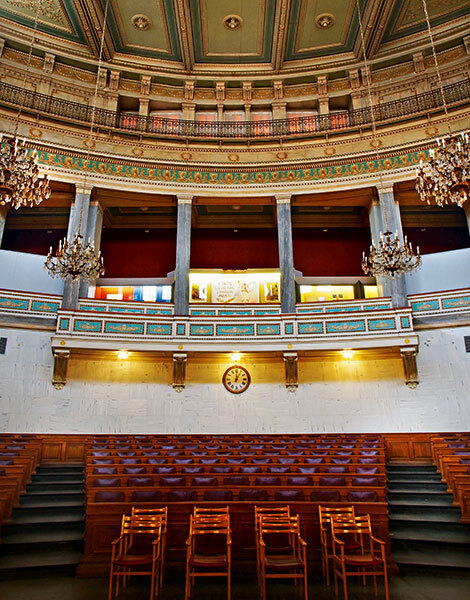 The beautiful chamber is lofty and imposing, crowned by the decorated guardrails of the public galleries. Today, it hosts formal events and important conferences. During its time as the seat of the national parliament, however, it bore witness to a particularly troubled period for Greece and was the scene of stormy political confrontations and debates featuring major political figures, including Alexandros Koumoundouros, Charilaos Trikoupis and Eleftherios Venizelos. In 1905, on the marble steps outside, Greece’s prime minister Theodoros Diligiannis was assassinated by a shady character from the city’s criminal underworld. 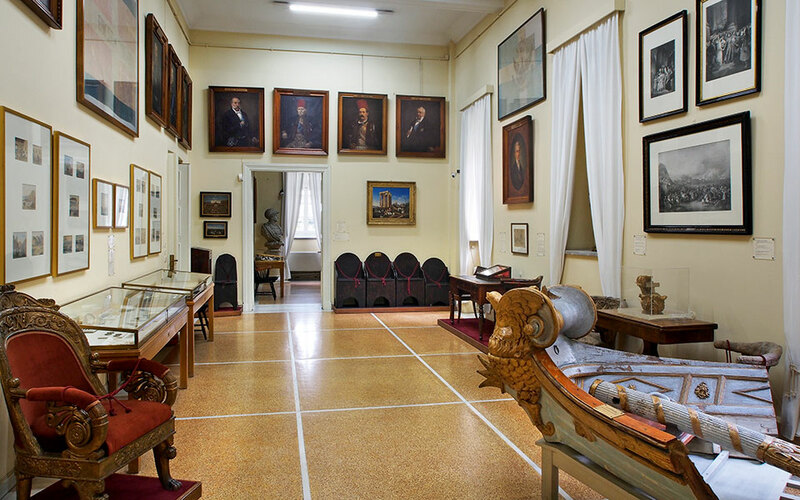 The museum's permanent exhibition includes an exhibition space dedicated to the era of Ioannis Kapodistrias and King Otto. The Historical and Ethnological Society of Greece was founded in 1882 and immediately set out to preserve documents and objects relating to modern Greek history, Frankish and Ottoman rule, and the Greek War of Independence. At that time, a number of that war’s protagonists were still alive. Members of the society literally knocked on doors to raise support for their endeavor. They scoured the country for important items, asking around and buying them up whenever the opportunity arose. By the mid-20th century, they had succeeded in accumulating thousands of pieces, which they had safeguarded through two world wars and many other disturbances, by storing them in crates at secure locations during periods of crisis. In 1960, the society took over the Old Parliament building in order to house and exhibit the precious historical objects, books and documents it held in its possession. Two years later, in 1962, the exhibits went on permanent public display. To this day, the National Historical Museum’s high visitor numbers prove its popularity remains unfailing. Greek warships were adorned with carved wooden mastheads depicting ancient heroes. The museum’s permanent collection is on display throughout the building’s corridors and in what were once the offices of members of parliament, which surround the debating chamber. Half of the space is dedicated to the periods of Frankish and Ottoman rule, the 1821 Revolution and further clashes with the Ottomans. In this section, you can see engraved prints, weapons and body armor from knights and warriors from the Frankish period as well as the weapons and the cane of Ali Pasha, the celebrated ruler of Ioannina (1788-1822), whose conflict with the sultan indirectly provided significant help to the Greek struggle for freedom. Also on display are objects, paintings and holy icons from the numerous philhellenic societies that were formed across Europe in this period and whose support contributed decisively to Greece’s struggle for independence – and eventual victory in 1830. Ships from the Greek navy played a critical role during the War of Independence, and figureheads, navigation instruments, standards, flags and cannons from these vessels take particular pride of place. 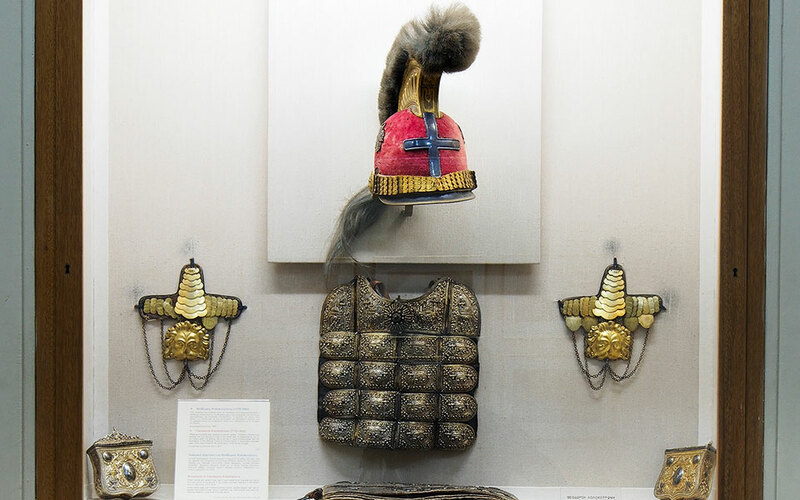 The armor and weapons of General Theodoros Kolokotronis, hero of the Greek War of Independence. It would be hard for anyone – especially a historian – to single out one particular item from everything on display, but if I had to choose one thing, I would pause for a moment at the 1797 Charta of Rigas Feraios, a proposed constitution for what Feraios envisioned would be a free pan-Balkan state. He was one of the leading figures of the Modern Greek Enlightenment, but met with a horrific death in 1798 at the hands of the Ottomans. Another personal highlight is the death mask of Kolokotronis, the illustrious revolutionary military leader who led troops in the Peloponnese. His imposing bronze statue (a 1904 work by Lazaros Sochos) outside the museum is also an Athens landmark. To commemorate the 200th anniversary of the 1821 Revolution, the museum is planning a wide range of events and activities. The museum's traditional festive and bridal costumes are among the oldest and rarest surviving examples in Greece. The other half of the exhibition space is dedicated to the history of Greece as an independent state, including its military exploits and its political tribulations. On display are objects and furniture from the royal palaces, which belonged to kings, gentlemen of the court and ladies in waiting. You can see the signed declarations from the uprising known as the September 3 Revolution, which led to the 1843 reform of the Greek constitution from absolute to constitutional monarchy. There is also furniture and personal items which belonged to Charilaos Trikoupis and Eleftherios Venizelos, the most prominent Greek politicians during the 19th and early 20th centuries respectively. Playmobil figures dressed in copies of the museum's costumes are popular with young and older visitors alike. 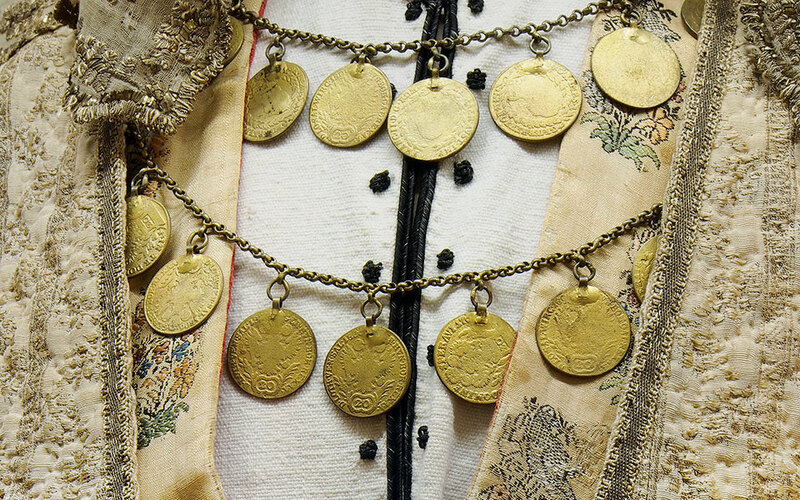 The most impressive corner of the museum houses a resplendent collection of traditional local costumes from the period of Ottoman rule; it’s a veritable feast of colors, needlework and jewelry from times long past. 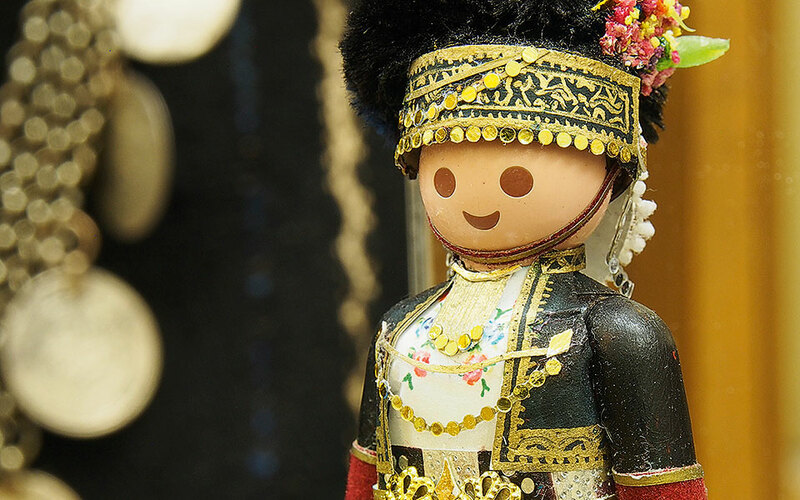 Alongside these garments, you can see intricate Playmobil figures dressed in miniature replicas (created by an inspired contemporary craftsman) of some of these traditional costumes. It’s only fitting that the spirit of the past prevails inside the museum, and yet, as you conclude your visit and step back outside, it’s your present that feels slightly altered; the Athenian light feels even brighter and the life unfolding across the capital acquires a new frame of reference, thanks to what you’ve learned about the country’s tumultuous past.